This week we are featuring the lovely Clover who is searching for her very own loving forever home. Clover is a tabby & white, short-haired female, estimated to be approx 3-4 years old. Clover came to us after being handed in as a stray, so we have no background information on her. She is a very affectionate girl, and enjoys lots of fuss and attention, and may well end up being a lap cat in her new home. Her favourite pastime is lazing upside down in the sun watching the world go by. 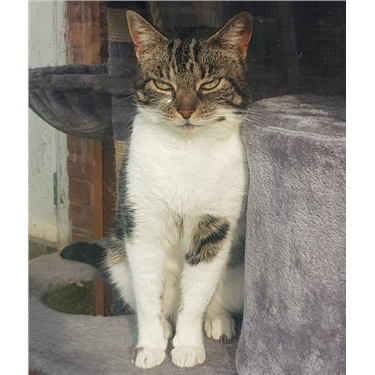 She is a very gentle natured cat and has not shown any problem with the other cats at her fosterers, so if introduced gradually we think she might be ok living with another cat, but her home should not have any dogs. We don't know if she has ever lived with children, so we would consider a home with children on the basis that we would see how she reacts when she meets them. As Clover came in as a stray we cannot be 100% sure if she has been neutered, if she does come into season in the future, Cats Protection would cover the cost of her being neutered. Can you help Clover find her forever loving home, we would love to see her back in a warm home with her very own family. Do you have space in your home and your heart for this gentle girl?